George Wesley Bellows, a socially-conscious American Realist painter, was born in August 1882. 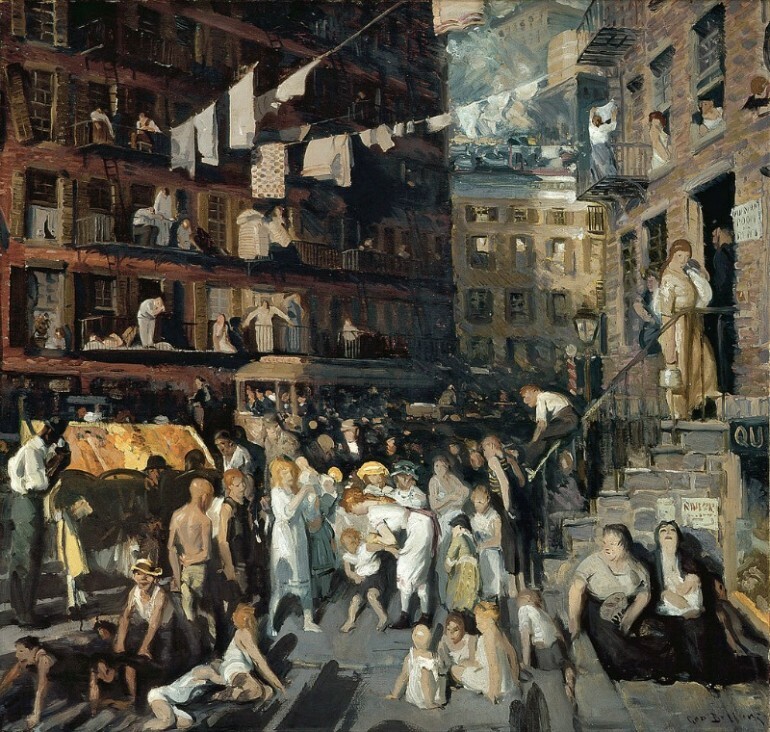 He became very popular for his daring depictions of New York City’s urban neighborhood. Bellows was from Columbus, Ohio. He was an only child who showed his talent for drawing before he started kindergarten. His teachers in elementary school recognized his artistic ability and always sought his help for classroom decoration for Christmas and Thanksgiving. Bellows did not start out as an artist, though. He wanted to be an athlete when he was 10 years old and trained to be a basketball and baseball player. He was good enough to play semipro for several years. He was recruited to play for Indianapolis but opted to join the Ohio State University. He played basketball and baseball for the school. At the same time he did the illustrations for the school’s yearbook, Makio. He was able to play baseball and still worked as a commercial illustrator and received magazine assignments throughout his career. The artistic calling got the better of him, and he decided to pursue painting; dropped out when he was about to graduate, and relocated to New York City. Bellows became a student of Robert Henri at the time when the artist was not yet famous and had not established his own school yet. Bellows took lessons from Henri while the latter was still a teacher at the New York School of Art. He soon became part of the Ashcan School where Henri was a founding member. He was likewise a part of Henri’s group of artists called “The Eight.” These artists supported the idea of painting modern day American society during their time in various forms. Among the students of Henri were Yasuo Kuniyoshi, a photographer and painter; Rockwell Kent, Stuart Davis, Arnold Franz Brasz and Edward Hopper. George Bellows was a one of the great Realist painters of the 20th century. He was not only a painter but also a lithographer. He’s best known for his urban cityscapes of New York and his genre paintings that were down to earth. He was the youngest, at age 27, to be elected as an Associate of the National Academy in 1909. Within four years, he became a full member of the Academy. That same year, he was involved in the organization of the International Exhibition of Modern Art (Armory Show). His paintings realistically depicted life in the urban areas of New York. While the paintings showed crowded scenes, they were still happy scenes. The paintings were depictions of social issues, which were regular topics before the onset of WWI. He gained widespread recognition in 1908, just 4 years after he set up an art studio with a fellow artist, Edward Keefe. Although critics said that the works were painted crudely, others saw them as boldly audacious and were steps ahead of their teacher. His reputation grew as he participated in many juried shows that were recognized nationally. Bellows did not go very far to find subjects for his paintings. 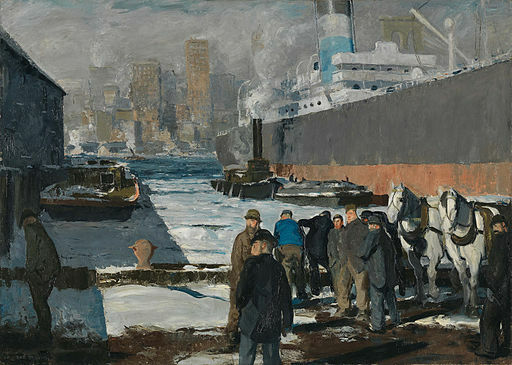 Many of his works depicted life in the urban areas of New York, showing the life of the city’s working class, their neighborhood and their normally chaotic and crude existence. He also did several paintings showing snowfalls in New York City. What’s remarkable was his strong grasp of visual texture and light, showing the contrast between white and blue expanses of snow and the grimy and rough surfaces of the buildings and other structures, as well as people. His clever and bold brushstrokes were able to depict dynamic movement and direction. It was a pity that Bellows left this world early. Throughout his career, he created pictures that mostly dealt with social issues. He also maintained that art should not be censored.